Revision with unchanged content. In a world, in which international business and globalization play an always increasing role, the direct relationship between culture and work output or company success is still not sufficiently recognized. 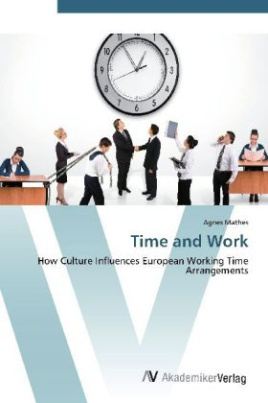 The majority of European managers do not perceive or even neglect the impact of culture on work. The author Agnes Mathes shows its influence and assesses potential conse quences for the European labor market. She first describes and analyzes culture with its dimensions and focuses on the dimension of time and its influence on business. After describing the European labor market and presenting the main working time arrangements and trends, she highlights some of their particularities and points out the values that lie behind them. The result shows the correlation between culture and work. This book addresses international companies and especially their Human Resource De partments, as well as economists, cultural scientists and trainers.